As the year begins, may I suggest a garden journal? It could be a pretty journal, a spiral notebook, or one of those planning calendars on sale now that has a section for notes in back. You can note when you planted and pruned, dreams for the future, plant wish lists, garden tips, seed orders, notes from garden talks, photos of your garden throughout the seasons, and more. If you are using a garden calendar, then note when garden chores should be done and the reminder will be there waiting for you. 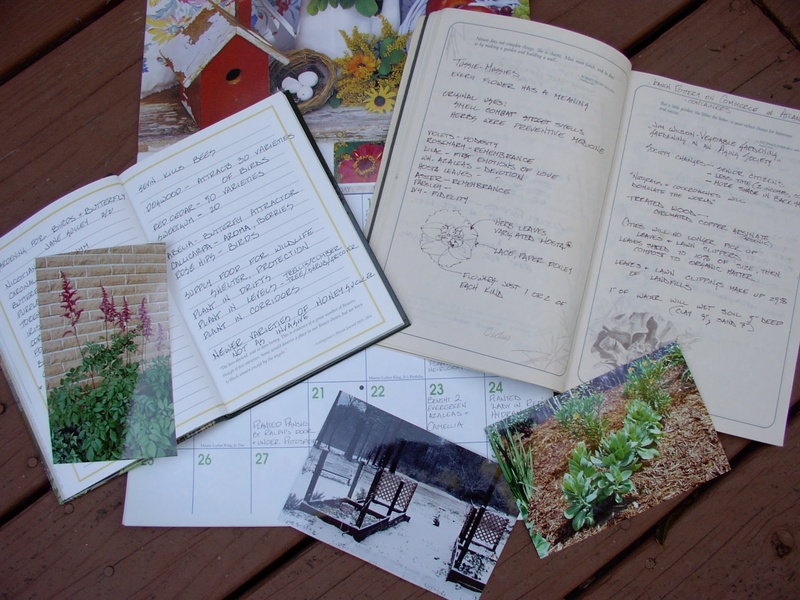 A garden journal can be a very useful tool and record for you. Hey! – I wrote a guest blog on the Gardeners Confidence website about container gardening. I’m so lucky to have a long asphalt drive under mature pines, because whenever the pine needles fall I can run out with my rake, scoop up fresh mulch and remulch the front beds. Extra mulch is piled up for later use (and becomes the favorite cat napping spot). Weeding the ground and mulching your plants for winter has oh-so-many benefits. First, just the action of getting beside each plant long enough to weed (and it doesn’t take that much time) gives you the opportunity to notice what is going on with your plants. Are they ready to divide? In Georgia, now would be a fine time to divide perennials. Would cutting off the spent flowers make it more attractive? Would moving this plant to a different spot be wise? Second, it looks good – really good. If you want your home looking great for a party or the holidays or, even more important, to make you happy, then a fresh layer of mulch is a quick fix. It unifies the landscape, makes a clear definition between lawn and beds and freshens the whole garden. That and a couple flats of annuals can work wonders. But mulch can also keep your garden healthy. It’s like putting down the winter blanket for your plants, keeping soil temperatures constant for plant roots (which grow year-round in Georgia). Mulch also stops rain from splashing soil onto the plants, eroding soil, or creating that hard crust that can form on top of soil. It discourages weeds from growing and makes them easier to pull when they do grow. The UGA Trial Gardens is hosting a Public Open House on Saturday, June 25, 2011 from 8 a.m.- 3 p.m. The garden will be featuring guided tours with Dr. Allan Armitage, a plant sale, heirloom tomato tasting, and a book sale/signing. A $5 donation is requested upon entry (make checks payable to “The Gardens”). For more information visit: www.ugatrialgardens.com or email contact@ugatrialgardens.com. Hat, water, and sunscreen. There are many wonderful things in this garden, but not a lot of shade. Totes. Who can resist a plant sale? So, since you know you are getting plants, come prepared. Clear out your trunk and bring a wagon or a couple totes to carry the plants. I love the bright plastic, round totes with handles that you can smoosh together to carry in one hand. Camera. Oh my, if you love taking pictures you will love this garden! Paper and pencil or a smart phone to take notes. Stamina. Yes this is a great open house, but Athens is full of wonderful restaurants, specialty nurseries and gardens. Do a little research and plan a whole day. I have put plants in an ice chest (without the ice) to keep them out of the sun and a little insulated on the drive home. Beware of leaving plants in a sunny, closed car while you walk into an air conditioned restaurant. The temperature can soar in just a few minutes. Leave the windows open a bit and look for a shaded parking spot (or eat really, really fast). We Could Lose Part of our Garden History. I first heard about the Farmers and Consumers Market Bulletin during a talk decades ago. My father and I took off in his pickup and traveled from NW Arkansas to visit my brother in Atlanta – of course we timed it so we would be in Atlanta during the Southeastern Flower Show. I don’t remember who the speaker was, just that I was so mesmerized by the charm of this publication that was talked about that I had to buy a copy of Elizabeth Lawrence’s Market Bulletins: Gardening for Love. Her book, her last of many garden manuscripts before her death in 1985, documents the friendships Lawrence made through correspondence initiated by ads in the Market Bulletin. She found out about them from Eudora Welty, who subscribed to market bulletins from several Southern states. This little newspaper, started in 1917 and distributed by the Georgia Department of Agriculture, is composed of free ads from people throughout the state – ads for home-made items, farm equipment, livestock, fresh eggs, seeds and plants, and more, plus a few articles. As I read the ads I can almost picture the person who wrote it, the one who crocheted the dishcloth, raised the chicks, used the farm equipment no longer needed, or is looking for a position as a farm hand. There’s a country charm that comes through the words. A couple years ago my husband could not resist that charm when he found an antique butter churn. “Look at the photos they emailed me. It’s just like the one my grandmother used to make butter”. As if that wasn’t enough, he added “I need to find someone with fresh Jersey milk”. Oh dear, we already had set up a chicken coop in the back yard, but churning our own butter? That Saturday we drove an hour, MapQuest printout in hand, to pick up our blue antique butter churn. We ended up chatting with the couple for a solid hour before we even saw the churn in their garage. They were lovely people. I can see why the Market Bulletin opened doors of friendship to Elizabeth Lawrence. It is filled with real people, much richer and more interesting than those in tabloid magazines. Subscriptions are available to Georgia residents at a cost of only $10 per year (26 issues); out-of-state-subscriptions are available for $20 per year. Out-of-state subscriptions must be within the United States or its territories. To start or renew a subscription, send a check or money order payable to Market Bulletin, along with your name, complete mailing address and daytime phone number (in the event the Market Bulletin office needs to contact you concerning your subscription) to the following address: Market Bulletin, Georgia Department of Agriculture, 19 Martin Luther King Jr. Drive SW, Atlanta, GA 30334-4250. New subscribers may also pay online with a credit card at www.thegamarketbulletin.com. Please note there is a $1 convenience fee added for online subscriptions. Not sure how it happened, but our 5 acres transformed quickly from a backyard with a vegetable garden and some fruit plants to a homestead. A few days ago it was too rainy to work outside, so I roamed the garden to see what edibles were forming on our plants. What happened??? We no longer are working toward a ‘landscape’; instead we have created a homestead interspersed with some really cool ornamental plants. Not that I’m complaining – I really am liking this, but oh my! We have 13 chickens (6 dozen eggs/week), 14 grapevines, 6 blueberries and at least as many blackberries. Oh, and the gardens – 2 vegetable plots, plus raised beds and cucumber and melon patches. The hops vines produce well. And fig trees – 3 mature trees plus 2 more in containers. I heartily suggest one, maybe two, fig trees. Any more is just too much and five is … well, the chickens will be feasting on figs. Mother Nature planted some for us – muscadines, elderberries (great in wine) and poke salet (ever had a poke quiche? – yummy!). The poor front garden is suffering as I hoe and gently coax tomato plants back into their cages. This three-day weekend I will commit to working on the neglected front, adding containers and flowers, pulling out plants that aren’t working and doing some serious pruning to the groves of variegated pittosporum. When pruned, they look like windswept trees. So I will never have the magazine-layout landscape – but I should have plenty of eggs and veggies to share with friends. Last week I joined a group of folks from the Georgia Plant Conservation Alliance, which is a diverse group of organizations throughout the state that have come together to meet plant conservation goals, to plant endangered Echinacea laevigata and other native wildflowers in North Georgia. This will help me complete 16 required hours of volunteer time so I can be in the second graduation class receiving a Certificate in Native Plants from the State Botanical Garden. Complete blog post at the State Botanical Garden site: http://tinyurl.com/ykgn2rp.